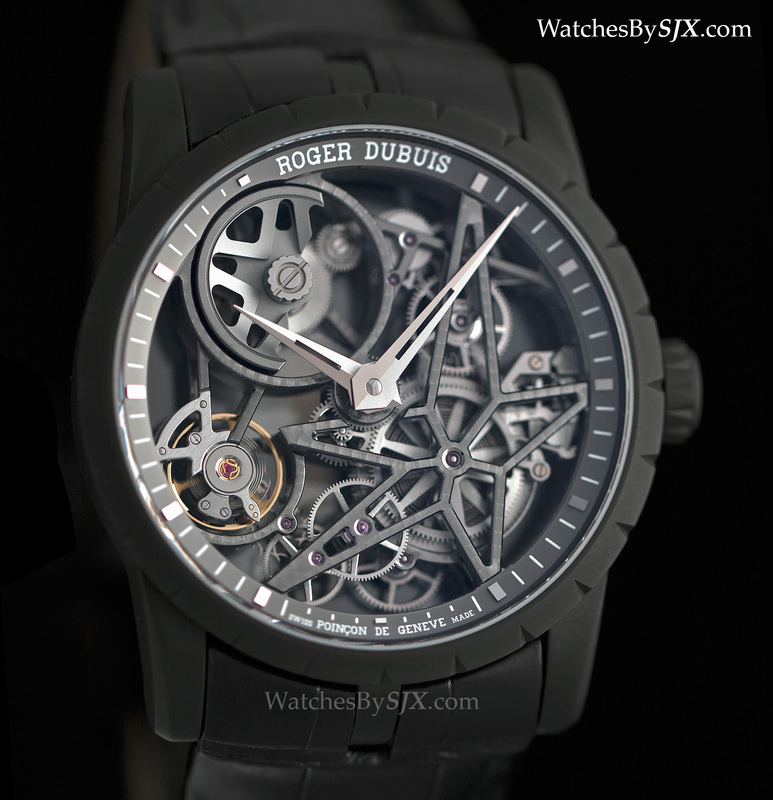 Skeleton watches were the entirety of the Roger Dubuis offerings at SIHH, encompassing its flagship Excalibur Skeleton Tourbillons, as well as a new, entry-level skeleton automatic. 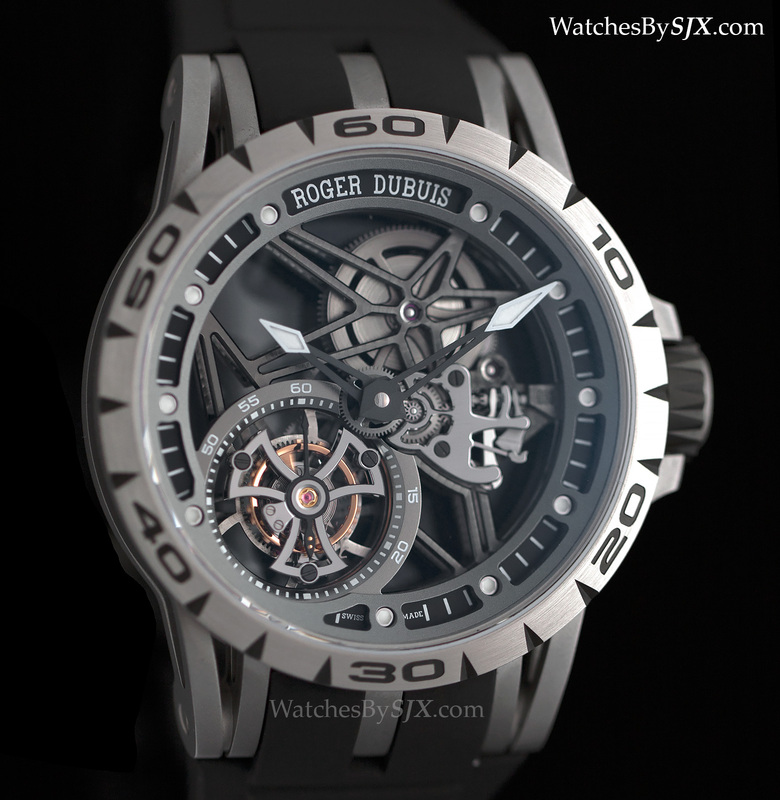 Roger Dubuis is synonymous with skeleton watches, particularly its open-worked tourbillons with their recognisable star-shaped bridges and skeletons were the focus of the offerings at SIHH 2015. 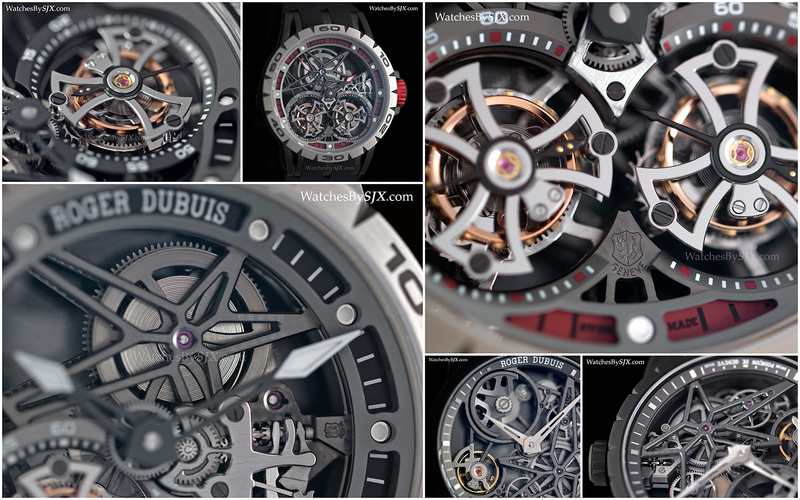 The new line-up started with the Excalibur Spider Skeleton Flying Tourbillon at the top of the price spectrum, and ending with the Excalibur Automatic Skeleton, the first skeleton watch from the brand that is not a tourbillon. Excalibur Spider is a new sub-line of the King Arthur-inspired collection with its distinctive notched bezel and triple lugs. 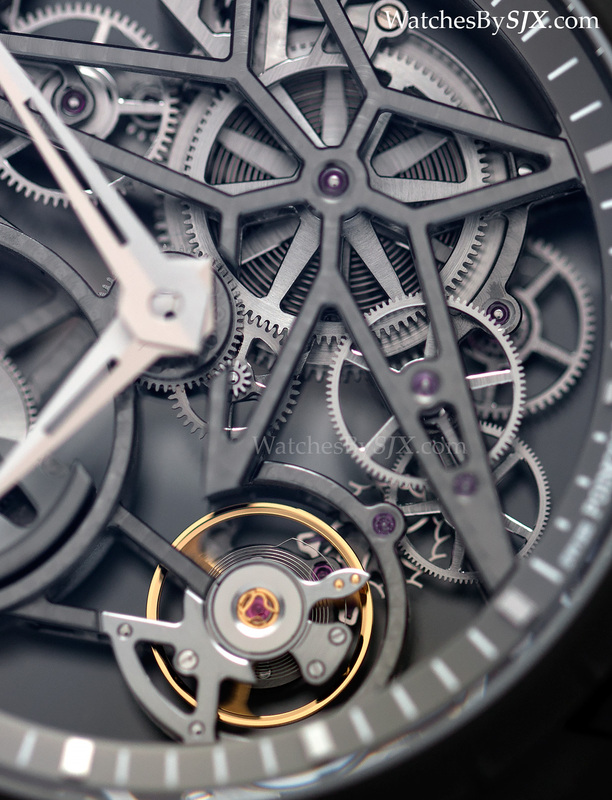 The Excalibur Spider watches have skeletonized cases, hollowed out at the lugs and flanks of the case, making them lighter, a useful feature for a watches that large. 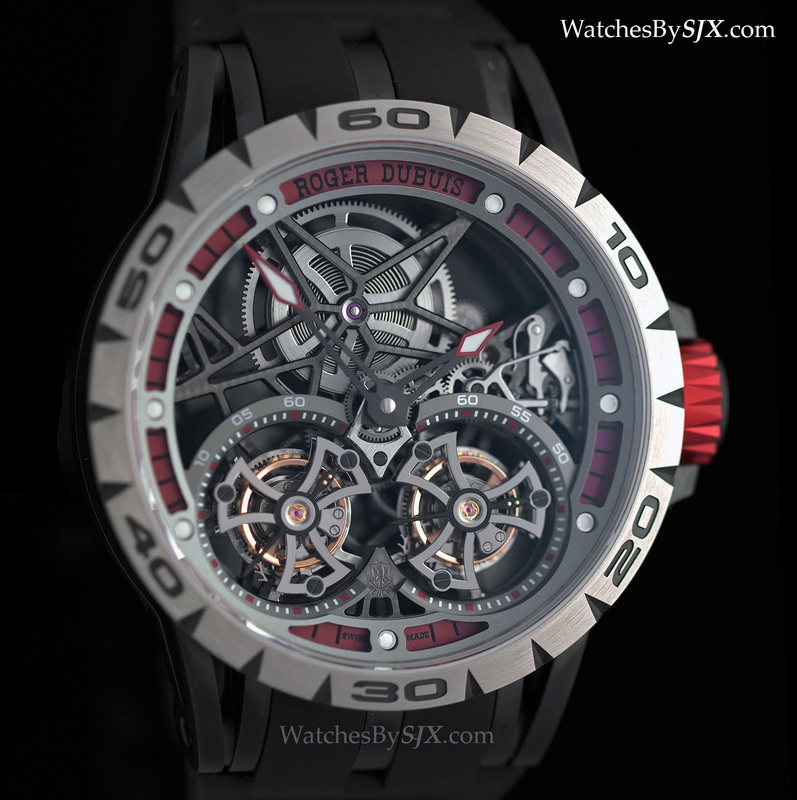 The Excalibur Spider Skeleton Double Flying Tourbillon has a 47 mm case in alternating titanium and black DLC-coated titanium, with striking red aluminum inserts in the case band, crown and dial flange. 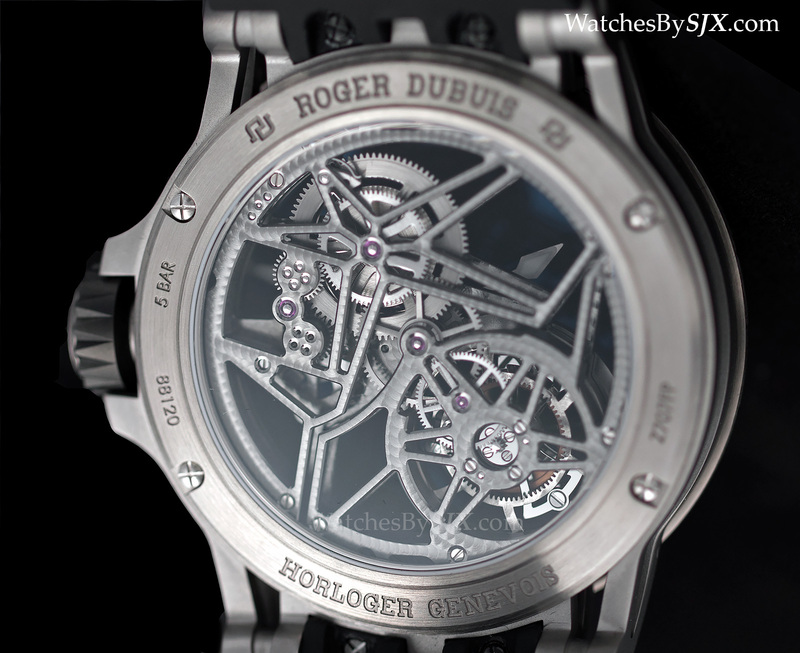 Despite its size, the weight on the wrist is modest, due to the skeletonized case. 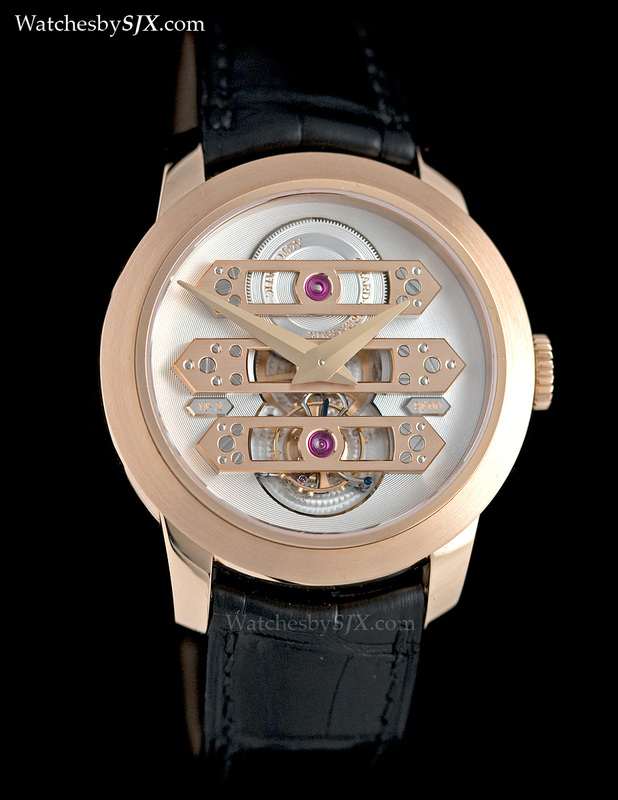 Inside is the RD01SQ movement, an open-worked movement with twin tourbillon regulators. 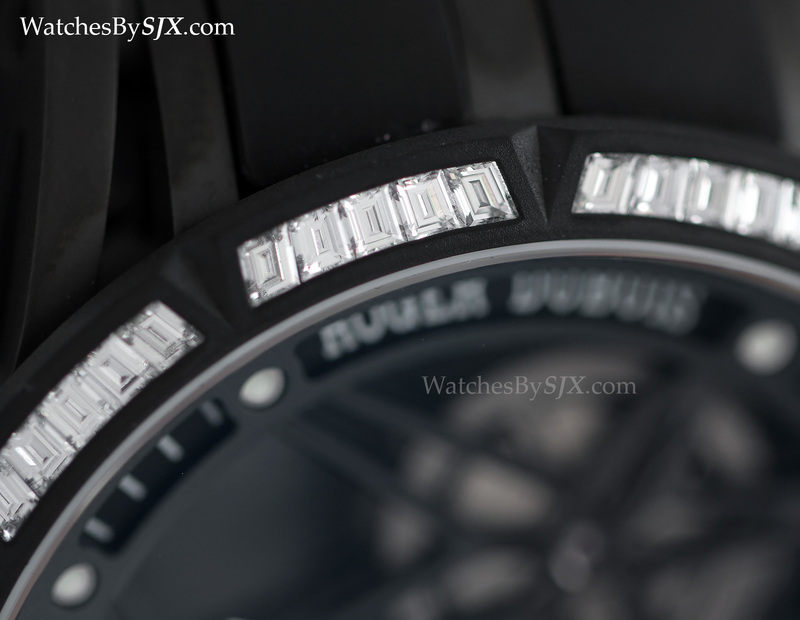 Coated in dark grey ruthenium and finished with perlage (also known as pearling), the bridges and base plate sparkle at certain angles as the perlage catches the light. 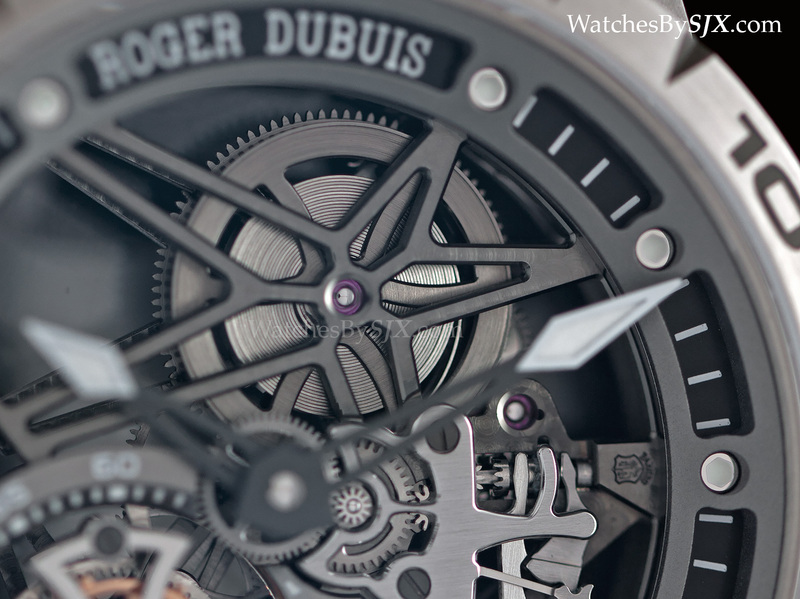 The barrel bridge is in the form of a five-pointed star, the trademark flourish in Roger Dubuis’ skeleton watches. 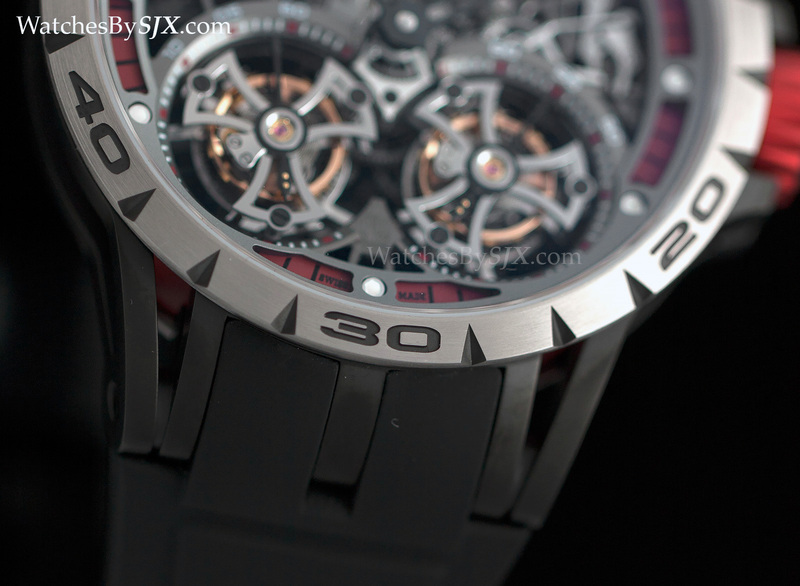 Limited to 188 pieces, the Excalibur Spider Skeleton Double Flying Tourbillon is priced at S$395,000. 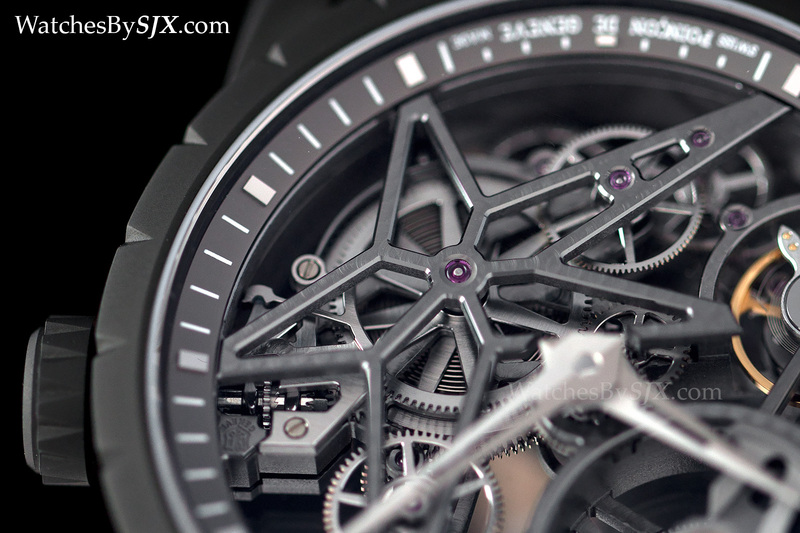 Similar but less flamboyant is the Excalibur Spider Skeleton Flying Tourbillon. 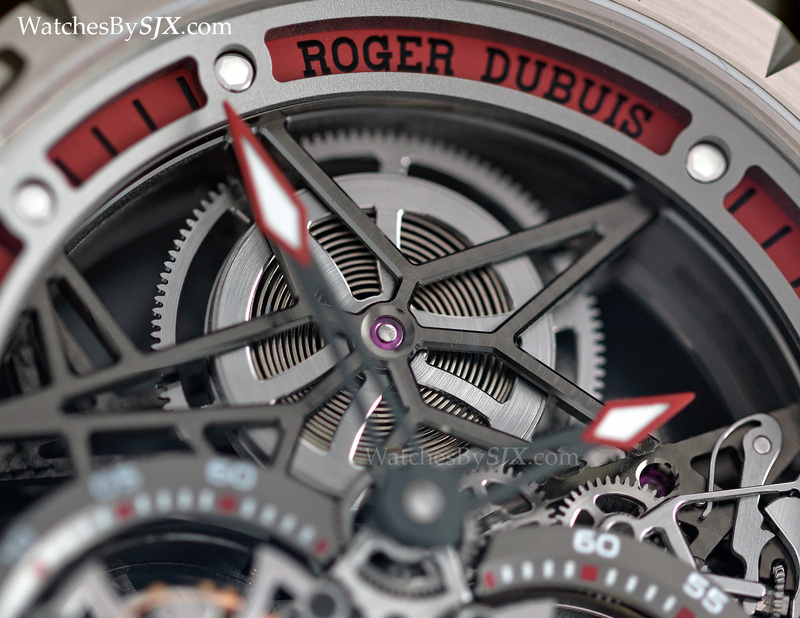 The case is also 45 mm and skeletonized, but it’s brushed grey titanium throughout for a more monochromatic look. 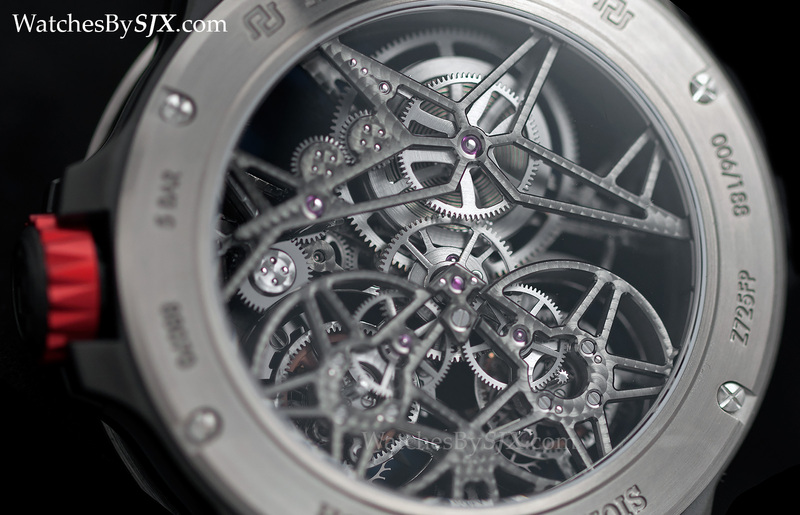 The movement is similarly styled, with the star-shaped bridge and pearled ruthenium plates, but with a single tourbillon. This is part of the regular collection, and priced at S$213,000. Another version of the Excalibur Spider Skeleton Flying Tourbillon is a limited edition of 88 pieces, with 60 baguette-cut diamonds set onto the rubber coating of the titanium bezel – the first time diamonds have been set into rubber. The rest of the case is finished a matte black DLC coating, giving it slightly more gloss than the matte rubber on the bezel. This will cost S$260,000. 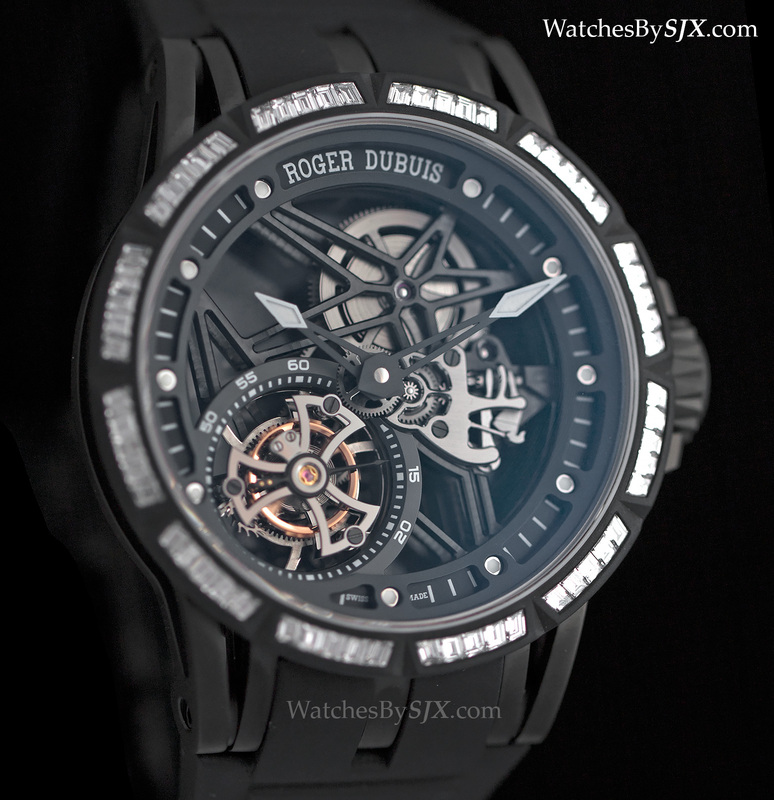 Much more accessible is the Excalibur Automatic Skeleton with the newly developed RD820SQ movement. 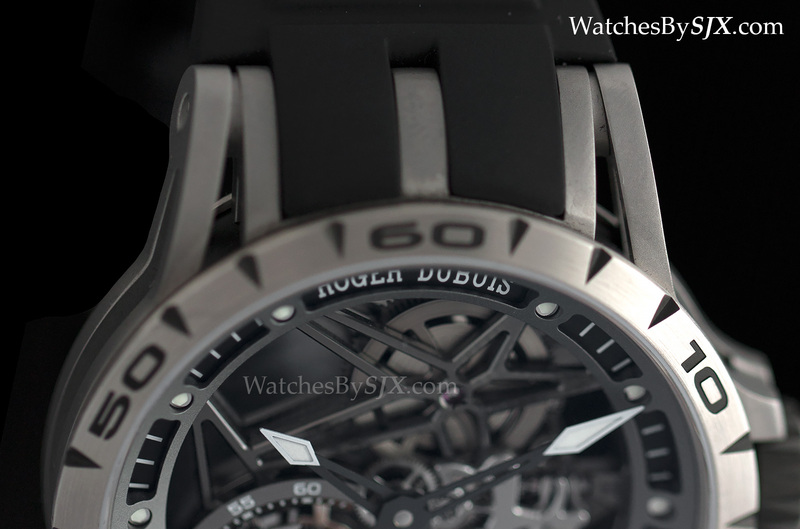 The most affordable Roger Dubuis skeleton watch to date, this has all the signature design elements of Roger Dubuis skeleton tourbillon watches, including the star-shaped bridge and perlage on the ruthenium-plated plates. 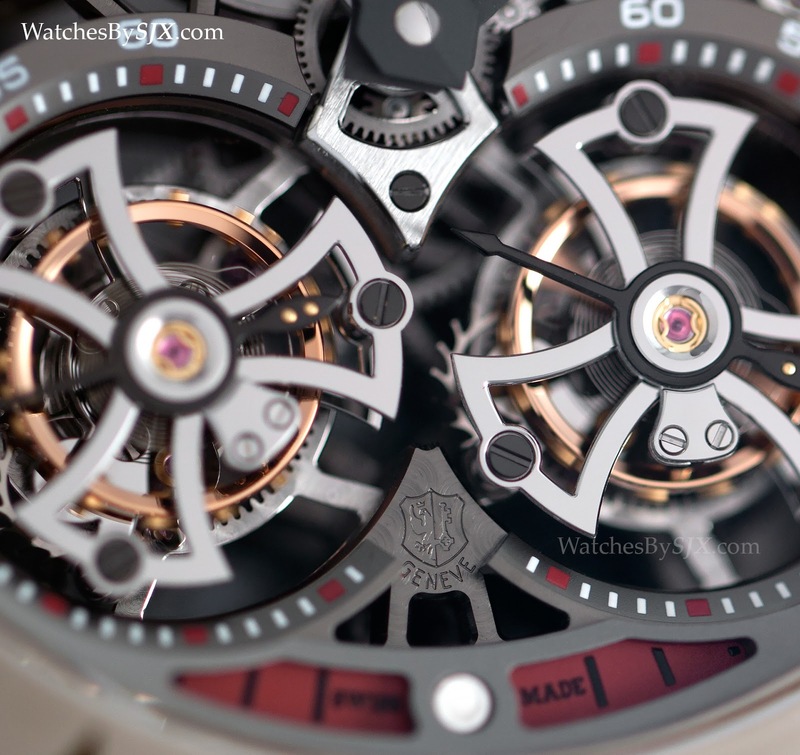 Visually it is extremely similar to the skeleton tourbillons, in fact the casual observer would find it hard to separate the two across a room. 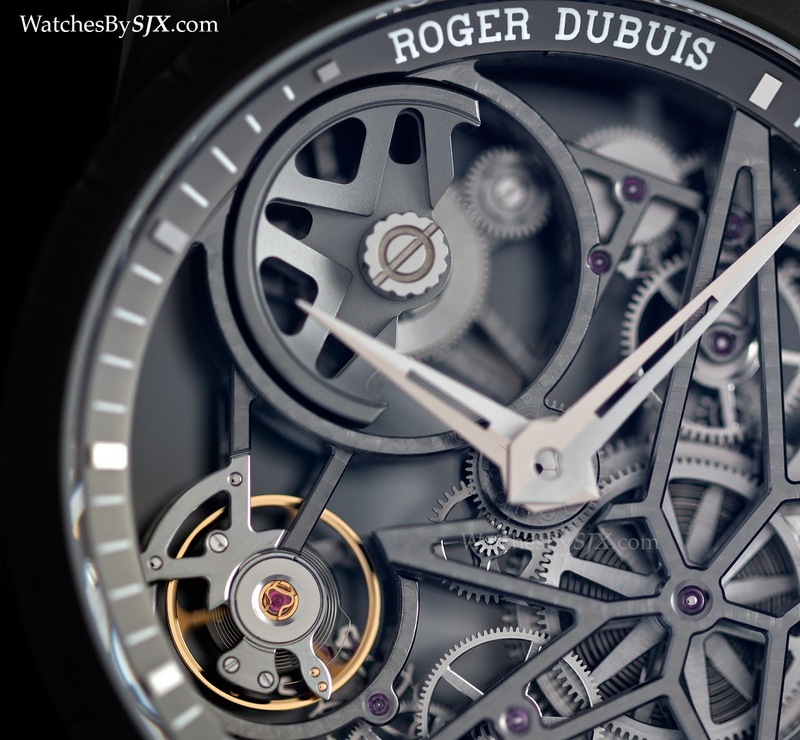 This is the first skeletonised, self-winding movement from Roger Dubuis. 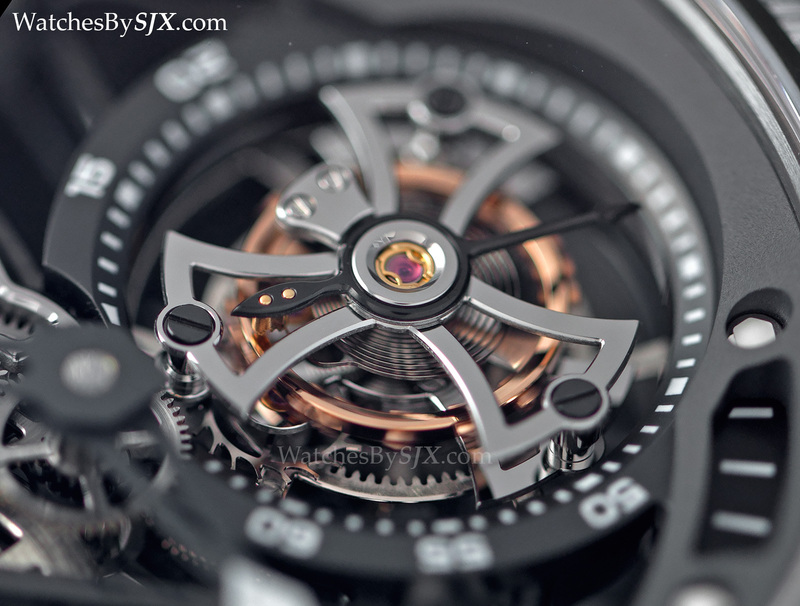 It’s essentially an inverted movement; all the action on the front with both the micro-rotor and regulator on the dial side. At 42 mm in diameter and 11.44 mm high, the Excalibur Automatic Skeleton is a manageable size, sliding easily under a cuff, and combines the brand’s signature look with a lower price. The Excalibur Automatic Skeleton starts at S$84,000 for the version in DLC titanium, rising to S$103,000 for the pink gold model. 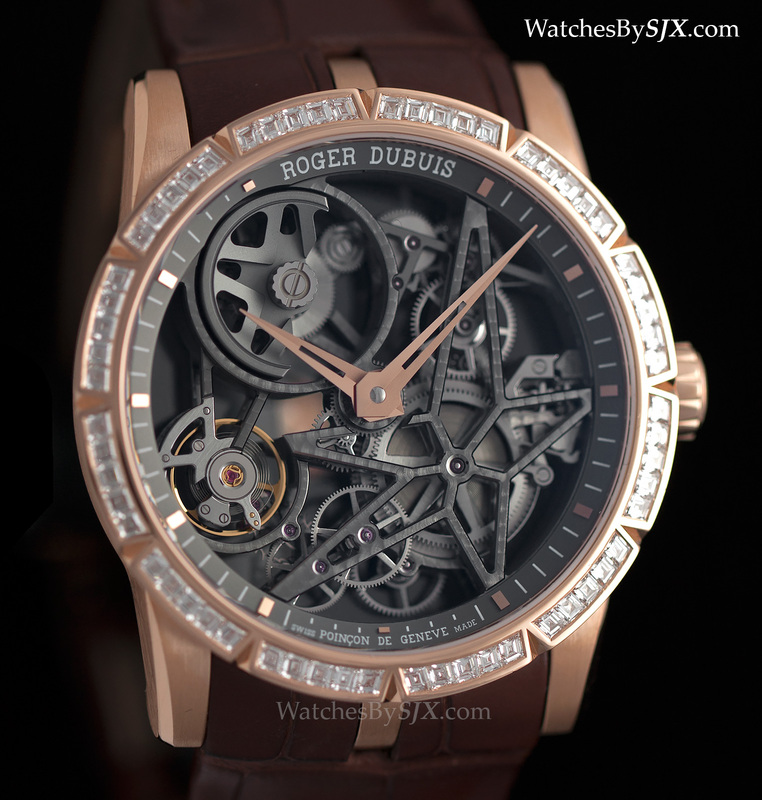 And the pink gold skeleton with a baguette diamond-set bezel is S$148,000.